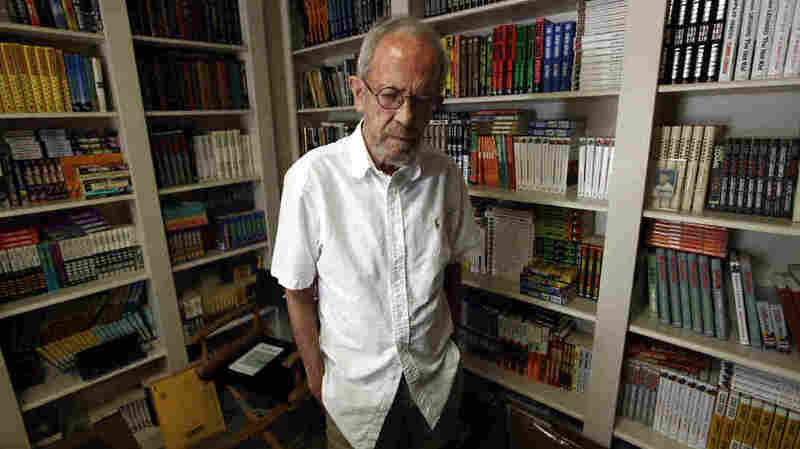 Elmore Leonard, The 'Dickens Of Detroit,' Dies At 87 Legendary crime writer Elmore Leonard published 46 novels, including Get Shorty and Out of Sight. His works were adapted countless times for film and TV. Noah Adams remembers the man whose advice to other writers was "try to leave out the part that readers tend to skip." In his home library, Leonard kept copies of every book he'd ever written. 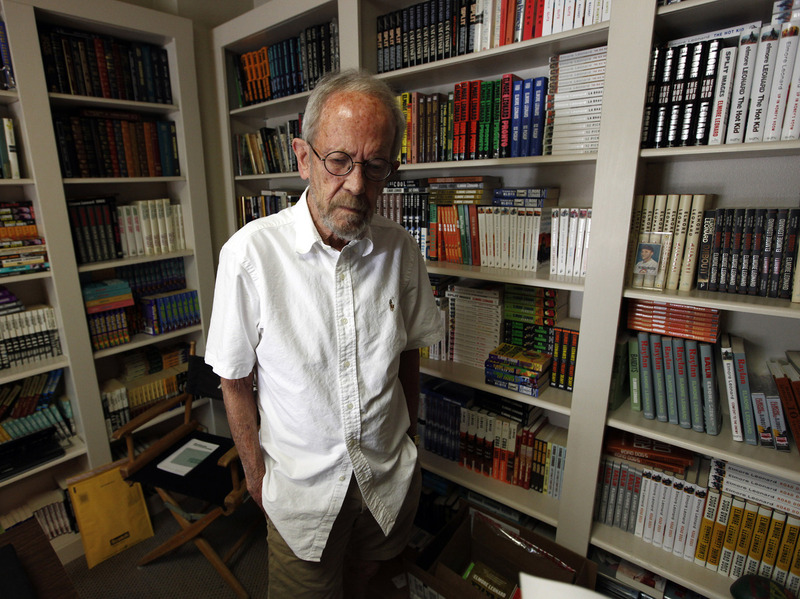 The writer Elmore Leonard has died. He was 87 years old and had recently suffered a stroke. For decades, Leonard — working at the very top of his profession as a crime writer — had been widely acclaimed, and universally read. He published 46 novels, which resulted in countless movie and TV adaptations, including the movies Out of Sight and Get Shorty and the TV series Justified. "And I've been using this paper ever since I left the ad agency where they used these pads," Leonard said in a 2010 interview. People ask me about my dialogue, I say, 'Don't you hear people talking?' That's all I do. Even before Bounty Hunter, Leonard had been an advertising man, a copywriter on the Chevrolet account. He was born in New Orleans, where his father worked for General Motors. They moved to Detroit in 1934. Then high school, the U.S. Navy, the war. Back from the South Pacific, he enrolled in the University of Detroit, studied English, then went off to work for the Campbell Ewald agency. At home early mornings, he wrote short stories on that yellow paper. He even wrote on the job, on a pad hidden in his desk drawer. He sold Western stories to magazines, for two cents a word at first. All along he was aiming for Hollywood — and in 1957 his story "3:10 to Yuma" became a movie; it's been made twice. In 1960 he left his job at the agency, left the Westerns behind for crime novels. "People ask me about my dialogue, I say, 'Don't you hear people talking?' That's all I do," he said in that same interview. And that could have been Leonard's secret, all this time. That could be why the writer and critic Martin Amis once called him "a literary genius who writes rereadable thrillers." Leonard listened to his characters talking; he tried to figure out what they might do next. Wrote it on his pad, typed it up, and there's the book. The crime novelist Megan Abbott says Leonard's novels work for other writers, and for the guy who just needs to kill two hours on a plane. "These are sort of dense, rich characters," she says. "The language just sparkles and pops; there's this sort of complexity to it, embedded in each of the characters ... there's something we can all take from it." Leonard once published, very helpfully, his 10 Rules of Writing, including maxims like "Never open a book with weather" and "Try to leave out the part that readers tend to skip." To which he added one extra bit of process: "If it sounds like writing, I rewrite it." He liked the way a couple of his films turned out on-screen, and for 1995's Get Shorty, he got to be on the set and advise the director. "I said when these guys say something funny you don't cut away to get laughs like that, because they're serious, they're all serious," he said. "Raylan just says, you know, 'Can you rack a load before I put a hole through you? I'm going to give you a choice here, but this is how it's going to go down if you chose the wrong way.' I just thought that would be a fantastic main character for a TV series." About Elmore Leonard's life work — it's easy to picture him sitting at his table with coffee and a cigarette, looking out at the backyard, listening to his characters, pleased by the TV show and the movies, and all his well-worn books in libraries, and especially the millions of 50-cent paperbacks in the used-book stores.